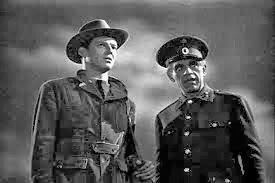 Synopsis: During the First Balkan War of 1912, General Nikolas Pherides (Boris Karloff) punishes one of his subordinates in the Greek army, an officer whose troops arrived late to the front during the battle that has just concluded. Despite the officer’s protests, and despite the battle's evident success, Pherides strips him of rank and gives him a pistol, allowing him to commit suicide. This cold-blooded behavior is questioned by American war correspondent Oliver Davis (Marc Cramer). But Pherides replies that what might seem like cruelty is simply grim necessity. War, the general says, does not allow for mistakes or excuses. He notes that the punished officer was an old friend of his. Walking outside with Davis, Pherides points out the men who are hauling bodies from the battlefield on a cart. They are working late into the night, the general says, because the bodies must be disposed of immediately. Cholera and septicemia are constant hazards on the battlefield. Once diseases of that kind begin to spread, there is little to stop them, and they can quickly wipe out a fighting force. The general mentions that his own wife died many years ago, and that she is buried in a crypt on a nearby island, an island that serves solely as a cemetery. The two decide to go and visit the grave, and they take a rowboat over to the island. But the general is distressed to find that his wife’s grave has been desecrated; in fact all the coffins in his wife’s crypt have been broken into, and now the bodies are missing. The two are about to return to the mainland when they hear a woman singing a haunting melody. This surprises both men, since they were unaware that anyone else was on the island. Following the singing, they find a number of people at the caretaker’s house. Albrecht (Jason Robards, Sr.) is an archeologist whose work on the island years ago incited the locals to desecrate graves in search of valuable antiquities. Mortified, Albrecht retired from his profession and has been living on the island ever since, having bought the caretaker's house from Madam Kyra (Helene Thimig). Also staying on the island during the fighting on the mainland are St. Aubyn (Alan Napier), his wife, the ailing Mary (Katherine Emery), and the nervous Mr. Robbins (Skelton Knaggs). There is also Thea (Ellen Drew), a lovely young woman whose singing drew the men to the house. Madam Kyra is convinced there is evil afoot in the house, and she draws General Pherides aside to tell him that she suspects the presence of a "vorvalacka" -- a supernatural being that suffuses itself with life by draining the health and vitality of those around it. Pherides laughs off this suggestion, telling her that he is too old to believe such stories. Davis wants to stay overnight in the caretaker's house, as he hasn't slept in a real bed in months. Though he doesn't mention it, he'd also welcome the opportunity to get to know Thea better. Pherides reluctantly agrees, figuring that he'll be able to inspect the shore artillery at first light on his way back to camp. However, during the night Mr. Robbins dies. Knowing that Robbins' symptoms are consistent with an outbreak of septicemia, Pherides summons the camp physician. Sure enough, Robbins is declared to have been killed by the plague. This means that the islanders are quarantined, and no one can come or go from there, including the camp doctor, reporter Davis or Pherides himself. Comments: Isle of the Dead is the first Val Lewton film to be broadcast on Horror Incorporated, and while it is considered to be one of Lewton's lesser works, it perfectly captures why his movies have had such an impact on audiences through the years. Lewton's approach to horror is unique. His movies are atmospheric, lyrical, almost dreamlike in the way they unfold. Their themes tend to be existential: death is always lurking just off-camera, and -- inevitably -- something beyond death too. 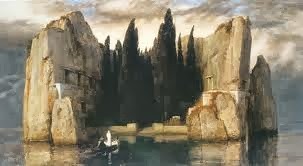 The title, as well as the haunting image of the island itself, is taken from a famous 19th-century painting by Arnold Bocklin. The painting depicts an island enclosed by forbidding stone cliffs. Towering cypress trees -- strongly associated with cemeteries -- grow in the island's center. A boat is being rowed to the island seawall; a hooded figure in white stands in the bow, just behind a white object which is usually interpreted as a coffin. Lewton was both frightened and fascinated by the painting as a child and he clearly wanted to make a film that captured its aura of mystery. The plot moves forward in a leisurely way, slowly building a sense of dread rather than trying to shock or terrify the audience. This tactic actually works quite well; we are inevitably drawn quite skillfully into the movie's reality. 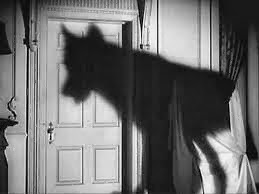 Lewton is forced to depend on a keen eye rather than a big budget to render its carefully-constructed verisimilitude. With a few historical references and modest costumes, he manages to convincingly set his film in the midst of the First Balkan War (all the scenes are shot on fairly small soundstages, and the distant view we have of the island is a matte painting). There are, in fact, only 11 speaking roles in the film. 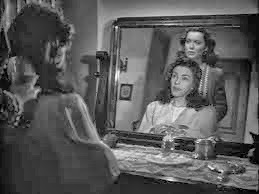 Lewton's protagonists tend to be practical and fairly unimaginative people, who are drawn unwillingly into the world of the strange and the supernatural. In Cat People, a nautical engineer marries a foreign woman with a deadly family curse; in I Walked With a Zombie a nurse finds herself mixed up with black magic when she takes a job in the Caribbean; and in Isle of the Dead a battle-hardened general comes to believe in the fearsome vorvalacka . Interestingly, the success of Lewton's signature style had no impact whatsoever on the way his films were sold. If you were to judge by the marketing materials, Karloff plays just another glowering nut. "ABANDON ALL HOPE! FOR THIS IS THE ISLE OF THE DEAD!" the trailer screams. "RULED BY BORIS KARLOFF....WHO SEALS THE DOOM OF ALL WHO DARE ESCAPE!" Of course Karloff's character isn't at all what the trailer leads you to believe. He isn't a lunatic, doesn't "rule" the island, and he isn't sealing anybody's doom -- in fact, he forbids the others from leaving the island in order to prevent the plague from spreading. Lewton had pretty much cornered the market on this sort of atmospheric fare since he was named the head of RKO's horror unit in 1942. 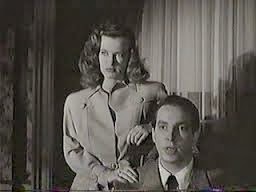 His first project was Jacque Tournier's Cat People in 1942, a low-budget hit that gave him a remarkable amount of creative freedom with the studio. In spite of the catch-penny titles (I Walked With a Zombie is guaranteed to trigger a snort of derisive laughter from those who haven't seen it) these films are quite sophisticated, and Karloff always seemed grateful to have appeared in this film as well as Lewton's Bedlam and The Body Snatcher. It's tempting to say that Val Lewton's early demise cut short his career (he died in 1951, at the age of 46) but the last of his influential cycle of films came some five years earlier. But he left behind a remarkable body of work, absolutely unlike that of any other horror producer. 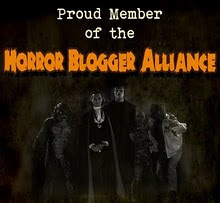 Synopsis: Dr. Charles Morris (Fritz Leiber) operates a museum of the occult, located in the former mansion of a famous Gypsy queen named Marie LaTour. Dr. Morris tells assistant Elsa Chauvet (Osa Massen) that he is about to publish a ground-breaking work on Marie LaTour, which will reveal important new information about her life. Elsa leaves to pick up Dr. Morris' son Bob (Stephen Crane) at the train station, but when the two of them return to the LaTour mansion they find Dr. Morris has been killed by an animal - apparently a wolf. Moreover, the notes he has compiled for his manuscript have been tossed into the fireplace and are mostly burned, and a tour guide who was present at the museum is now babbling incoherently, his mind apparently broken by what he witnessed. Bob and Elsa devise a way to reconstruct some of the information from the burned notes, and this leads them to investigate the mythology and practices of the Gypsies. Marie LaTour had purportedly been a werewolf, and as the Gypsies are a matriarchal society, her daughter -- also named Marie LaTour -- has inherited her lycanthropy. Comments: After our sojourn to Val Lewton's island, we're now back in familiar ground with Columbia's Cry of the Werewolf. 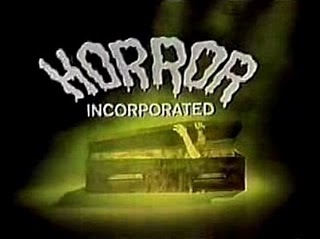 This is the third broadcast of the movie on Horror Incorporated, and it has been firmly relegated to second-feature status. It's relatively low-octane stuff, with the shocks and special effects kept to a minimum. The same could be said, of course, for Isle of the Dead, but the creative decisions made in that film were in service to the plot. Here, they appear to be due to a lack of both money and imagination. Columbia had never shown much interest in the horror genre, aside from a string of standard-issue mad scientist pictures written for Boris Karloff in 1939 - 1940, when he was under contract with the studio. Lew Landers' Return of the Vampire came along a few years later, and was an obvious homage to the previous decade's Universal horror films. It was the success of that film that paved the way for Cry of the Werewolf. Unfortunately, Cry of the Werewolf lacks a few things that were present in Return of the Vampire. We have neither a strong protagonist nor antagonist. Instead of the Van Helsing-esque Lady Ainsley, who had been played with great verve by Frieda Inescort, our attention is split between Ona Masson as Elsa Chauvet and Stephen Crane as Bob Morris. Masson, it should be said, is an engaging actress. The trouble here is her character is almost entirely passive: her main function is to moon over the painfully dull Bob. As for an antagonist, there isn't a Bela Lugosi in sight. 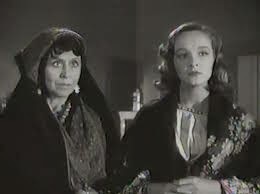 Instead we get Nina Foch, who did well enough as young Nicki Saunders in Return of the Vampire. But she is miscast here, pressed into service as gypsy queen Marie LaTour. She is a bit young for the part, distinctly lacking in gravitas and never comes across as much of a threat, despite her ability to change into a wolf. You'd think that would establish her badass bona fides, but somehow Foch seems like a rather perfunctory villain. 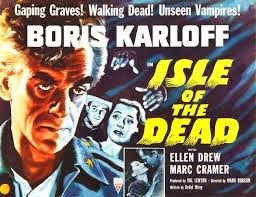 ISLE OF THE DEAD was always my least favorite of Lewton's 3 Karloffs. Both were leery of working together, but found they had much in common, as all 3 titles are extremely literate and realistic. Boris said of his RKO producer: "he rescued me from the living dead and restored my soul" (he had just finished a pair of Universals, THE CLIMAX and HOUSE OF FRANKENSTEIN, following his long Broadway run doing ARSENIC AND OLD LACE). 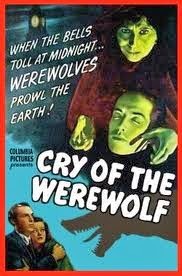 CRY OF THE WEREWOLF failed to inspire any further horror efforts from Columbia, most of which featured either Karloff or Lugosi.